One of the first accurate depictions of the Caspian Sea. Carte des Pays voisins de la Mer Caspiene. This is an attractive 1723 Guillaume Delisle map of the Caucasus is one of the earliest to place Carl Van Verden and S. I. Soimonov's 1719 -21 mapping of the Caspian Sea in the geographical context of the surrounding region. It covers from the Black Sea to Independent Tartary and from Russia to Persia, inclusive of the entire Caspian Sea, and the modern day nations of Georgia, Armenia, Azerbaijan, Kazakhstan, Turkmenistan, Iran, and Turkey. This is one of De L'isle's most important and misunderstood maps. Knowledge of the Caucasus and Caspian Sea region was extremely limited in Western Europe and so Delisle composed this map from assortment of sources, many of whom he lists in the title cartouche, including the Russian explorers, Persian diplomats, Georgian aristocratic and religious figures, and various Russian surveys. 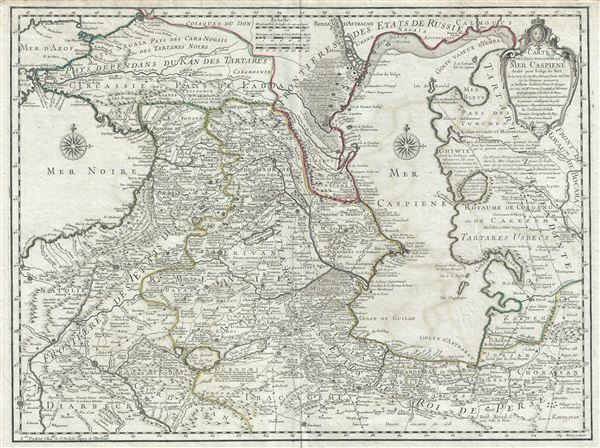 In 1721 Peter presented the French Royal Academy with a copy of S. I. Soimonov and Carl Vanverden's map of the Caspian region. The result is this remarkably accurate map, a major step forward in the cartographic perspective of the region, and one of the finest maps Delisle ever produced. Peter the Great, Russia's most expansionists Tzar, was determined to make the Caspian a 'Russian Lake' and invaded the region in 1722 seizing Derbent and Baku. Adorned with a beautifully engraved title cartouche in the top right quadrant, this map was engraved by Marin and drawn by Guillaume Delisle in 1723. Very good. Minor wear along original centerfold. Original platemark visible. Minor offsetting. Rumsey 4764.080. Allen, W. E. D., 'The Sources of G. Delisle's 'Carte des Pays Voisins de la Mer Caspiene' of 1723,' Imago Mundi, vol 13 (1956), pp. 137-150. Laor, E., Maps of the Holy Land: Cartobibliography of Printed Maps, 1475 - 1900, E 111, p. 74.